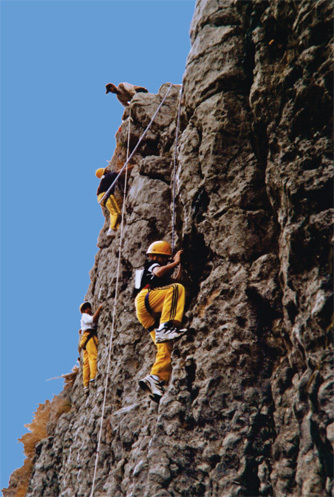 Give practival training in the basic techniques of mountaineering including rock climbing, ice climbing and rope work, also covers mountain search and rescue operations. Elevations up to 5000 meters may be achieved. Some experience in wilderness travel is preferred. Essential for Camp Counsellors and Wilderness Guides and Mountain Guides to qualify for certification. An introduction to the fundamentals of bouldering and rock climbing, Intended for children with no technical climbing experience designed to suit all ages. The single day lesson can be repeated by progressive stages on three weekends. 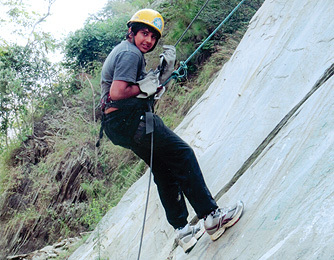 This introduction course gives you the chance to learn all the basic Rock Climbing skills in a practical and safe way under the direct supervision of our experienced instructors. You will cover basic rope work, equipment selection, bouldering, top roping and single pitch climbs. Designed especially to meet the needs of beginners having no previous experience. Open to Children 11-14 years of age. Designed for climbers with basic skills who desire to advance their grade. Along with basic rope work, advanced climbing techniques will be practiced including multi-pitch lead climbing. Open to youth aged 18 years and above.